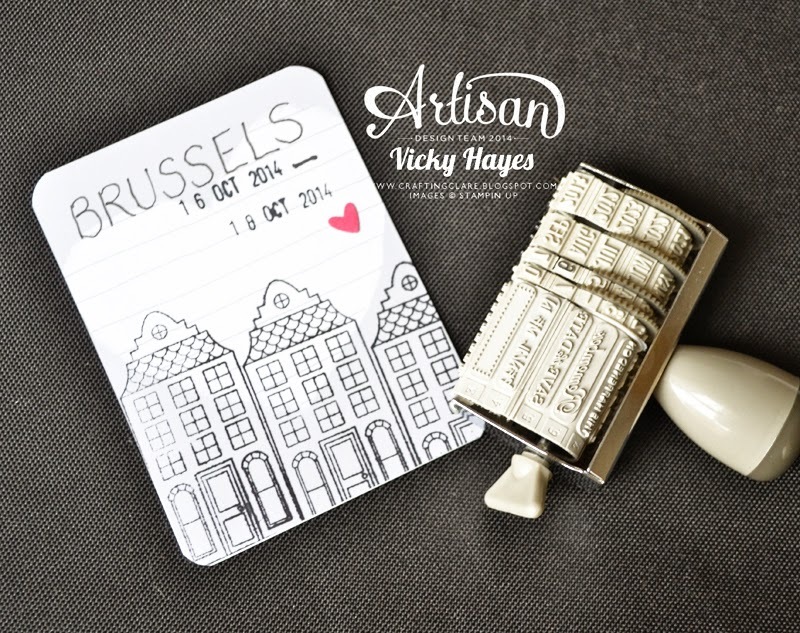 Thursday has rolled around again and all the members of the Stampin' Up Artisan Design Team have been beavering away on more inspiring projects to show you! Are you ready for another fabulous blog hop? The Simply Created Banner Refill pack is great for making your own banners to help set the scene at a celebration but, if you have any of the canvas pennants left over, how about making a little no-sewing-required pouch with two of them? I've used mine to hold photos but you could put any small gift inside. 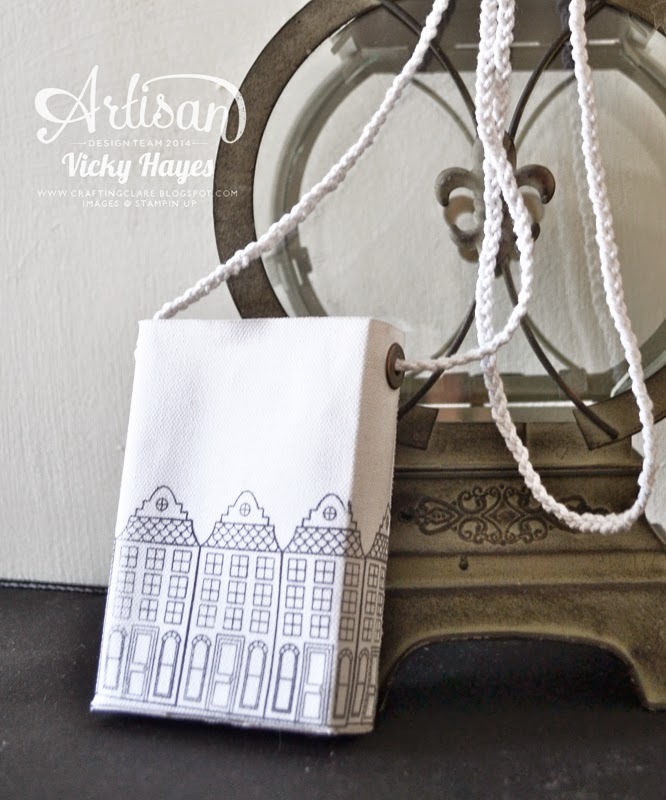 Before assembling the pouch, I stamped it with one of the houses from the Holiday Home stamp set using Stazon ink. The shape of this house really reminded me of the beautiful architecture in Brussels. The large eyelets on the banners form the perfect place to thread a handle through. I made mine by plaiting some of the natural coloured twine from a Tag-a-Bag accessory set but ribbon would work well too. Project Life makes it so quick and easy to record important events - you simply slide your photos and journalling cards into pockets. But I used my journalling cards to back my photos so I could pop them in the pouch like a pack of cards! Some of the cards had space for journalling so I could add a sentence or two to add to our memories too. I've used the Love Story Project Life Card Collection from the annual catalogue - it was among the fabulous gifts we were lucky enough to receive at Convention! The small cards in the pack are 4" x 3" and guess what? Photo machines in the supermarkets print this size from a memory stick or directly from your mobile phone very cheaply and while you wait! Once the photos were mounted, I rounded the corners and made the cover by stamping a card with the same house stamp as I used on the pouch. I added the dates of the trip with my Remember rotary stamp and a tiny heart. If you don't want to make the pouch, you could simply clip these together with a metal binder ring. Edited to add: Do you want to know how to make the canvas pouch in today's project? Well here's a video to help you! BUY THE SUPPLIES TO MAKE MY PHOTO POUCH NOW! My daughter and I spotted these fabulous boots in a shop in Brussels and, if they hadn't cost 265€, I would've bought them like a shot! For my birthday this year, my husband gave me a pair of yellow sandals that I had admired very loudly and at great length (gentle hints don't work with my husband!) My wicked children teased me about them. "Look! She's wearing The Yellow Shoes!" they would say whenever I wore them. "Nothing bad could EVER happen while you're wearing The Yellow Shoes!" See you tomorrow when I'm planning to have a video tutorial for you! What a fabulous idea - I really like the pouch and the photos are a lovely memory of a great weekend together. Lovely work. And those boots are lovely! What beautiful project. It is really amazing. Wonderful project Vicky. Great keepsake. Ohmygoodness, Vicky ... this is just BEYOND divine! What a fabulous gift for your darling daughter. She will get such pleasure re-living your trip, over and over again. Magic project! What a great idea Vicky! Delightful! Will I be able to have the same ? I love this idea ! What a lovely idea, I'm sure she will be thrilled with this. As for the boots - big sigh! What a wonderful project, Vicky - Love it! how did you think of that? so fun! What a fabulous use of these products! How did you adhere the two banners together? Inspirational as always. A lovely project Vicky. I love this! What a great idea, and a fantastic keepsake of your trip together for your daughter. I think you would totally rock those boots!